President-elect Donald Trump’s nomination for CIA director has advocated for mass data collection from U.S. citizens and has criticized Trump’s foreign policy strategies. 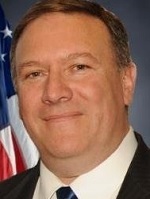 Rep. Mike Pompeo, R-Kan., urged Congress to allow the National Security Agency to restart its bulk collection of metadata while adding that to financial and “lifestyle” information that would all be searchable in one database. The metadata that the program would target is information about the people that individuals talk to, the length of the conversations, and location information, but not the content of conversations. The lifestyle data includes data gathered through a Census such as birth date, marriage information, death records, and legal proceedings. Pompeo said that as a member of the House Permanent Select Committee on Intelligence he was able to examine the metadata collection program and thinks that it was effective and constitutional. Pompeo said that “reasonable” warrantless searches are admissible under the Fourth Amendment, which means that data collection should also apply. After NSA Contractor Edward Snowden leaked information about this program, officials favored regulating the NSA in order to stifle the data collection. Pompeo said that in light of recent terrorist attacks, these regulations should be rethought. Pompeo introduced the Liberty Through Strength Act II, which would restore the NSA’s surveillance powers without allowing the agency to target any specific person in the United States. The bill didn’t pass the Senate. Pompeo has also promoted stronger anti-terrorism policies than Trump suggested during the length of his campaign. Pompeo said that the opinion that many defense leaders hold that technology companies should build a back door into their encryption in order for law enforcement to access potentially illegal activity online will only force terrorist groups to move to stronger and more independent forms of encryption. However, Pompeo said that encryption hinders surveillance capabilities.